(CNN) -- American journeyman Lucas Glover denied Phil Mickelson a fairytale victory at the U.S. Open as he kept his nerve to close out a two-shot victory at Bethpage Black on Monday. Glover celebrates claiming his first major title by two shots from a trio of chasers. Mickelson, who was playing while his wife Amy battles breast cancer, had to settle for a share of second place with fellow Americans David Duval and Ricky Barnes. 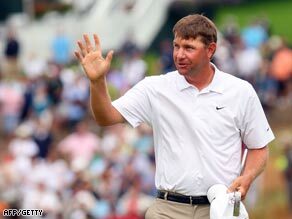 It was a record fifth runner-up finish at the U.S. Open for Mickelson as Glover, who had not won since 2005, fired a final round three-over-par 73 in tough and windy conditions to finish on four-under 284. Mickelson, with the majority of the final day crowd rooting for an emotional victory, eagled the par-five 13th to move into a share of the lead at four-under with Glover, but crucially dropped shots at 15th and short 17th. "I put myself in a great position to close it out but I didn't finish it off," Mickelson said. "Certainly I'm disappointed but now that it's over I have more important things going on." Duval, who not featured in a major for several years, carded a hat-trick birdies to the 16th to briefly join Mickelson and Glover on three-under, but also bogeyed the 17th as he lipped out. It was his first top 10 finish since 2002. Defending champion Tiger Woods was also briefly a factor but saw a string of birdie opportunities go to waste as he closed with a 69 to finish tied with Soren Hansen of Denmark in sixth place on level par 280. "I gave myself so many chances and I made nothing," said Woods as he rued his missed putts. Ross Fisher of England was another to challenge on a topsy-turvy final day as he got to three under by eagling the 13th, but like so many others fell away to finish in fifth at one-under. Glover, who had started the final day of the rain-hit major in a tie for the lead at seven-under with the surprising Barnes, gave himself vital breathing space with his lone birdie of the day on the par-four 16th. He takes home a check for $1.35 million in claiming his first major. The second major of the season was struck from the start by torrential rain which flooded the course in New York State and pushed the fourth-round finish to Monday for the first time since 1983 and only the second time ever.